WELCOME OCEANA HERALD-JOURNAL: We’re pleased that the Oceana Herald-Journal has become the newest member of Capital News Service. LAST REGULAR FILE & BONUS WEEK AHEAD: Next Friday, April 29, will be our last regular file of the semester. On Friday, May 6, we’ll move our traditional end-of-semester Bonus Week budget with still-timely stories you may not have had space for earlier. SUMMER ENVIRONMENTAL COVERAGE: Through our partnership with Great Lakes Echo, we will again this summer send you three packages of environmental stories — in early June, early July and early August. INFANTMORTALITY: Although infant mortality rates have decreased, they’re rising for member of some ethnic groups and in some locations. The Allegan County Health Department says it’s hard to collect infant mortality data since its hospital obstetrics unit closed. Among other counties without units are Cheboygan, Lake, Leelanau, Gladwin, Benzie, Mackinac and Montmorency. We also hear from the Department of Health and Human Services and Michigan League for Public Policy. By Jasmine Watts. FOR HOLLAND, LAKE COUNTY, LEELANAU, TRAVERSE CITY, GREENVILLE, ALCONA, CHEBOYGAN, GLADWIN, LANSING CITY PULSE, MONTMORENCY, OCEANA, BIG RAPIDS & ALL POINTS. WASTINGDEER: DNR wants to double the number of areas monitored for chronic wasting disease, adding six townships in Eaton and Clinton counties. The concern is over the disease’s long-term impact on the state’s deer population. Other positive samples have been found in Ingham County and elsewhere in Clinton County. We talk to DNR, Michigan United Conservation Clubs and the Michigan Department of Agriculture and Rural Development. By Josh Bender. FOR ALL POINTS. EXPORT: Michigan growers and processors of agricultural products can gain access to market research without paying thousands of dollars, thanks to a new, free export opportunity analysis. It’s a valuable tool for growers and processors of a variety of products including apples, wine, potatoes, dry beans, tart cherries, dairy products, blueberries and breakfast bars. China is a prime opportunity location. We hear from the Department of Agriculture and Rural Development and the Cherry Marketing Institute. By Jasmine Watts. FOR GRAND RAPIDS BUSINESS, TRAVERSE CITY, LEELANAU, GREENVILLE, LUDINGTON, BIG RAPIDS, STURGIS, THREE RIVERS, BLISSFIELD, CRAWFORD COUNTY, GLADWIN, CADILLAC, MONTMORENCY, ALCONA, OCEANA & ALL POINTS. DEADBIRDS: Using satellites to follow dead waterbirds drifting on Lake Michigan may be the key to locating the source of the elusive botulinum toxin, which causes paralysis and death in birds. 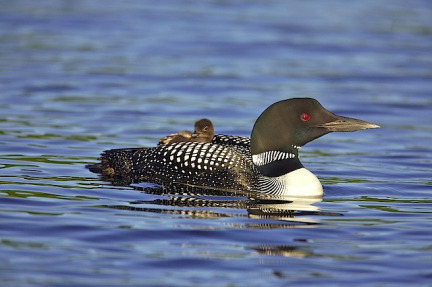 In 2012, hundreds of dead loons were found at Sleeping Bear Dunes National Lakeshore. To track down where waterbirds might be exposed to the toxin, a new study developed a model of how loon carcasses drift, using an approach similar to that of search-and-rescue operations, Experts from the U.S. Geological Survey and National Park Service explain. By Colleen Otte. FOR LEELANAU, TRAVERSE CITY, OCEANA, CHEBOYGAN, MANISTEE, LUDINGTON, HOLLAND, ALCONA, SAULT STE. MARIE, ST. IGNACE, MARQUETTE, BAY MILLS, PETOSKEY, HARBOR SPRINGS & ALL POINTS. w/DEADBIRDPHOTO: Loon. Credit: U.S. Fish & Wildlife Service. INLANDFISHERIES: Inland fisheries and aquaculture account for more than 40 percent of the world’s reported fish production but their harvest is frequently under-reported and ignored, including in the Great Lakes region, a new study says. And the condition of inland fish in aquatic ecosystems makes them “aquatic canaries in the coal mine” concerning ecosystem change, including threats from agriculture, hydropower projects and deforestation, as well as overfishing and invasive species. We hear from researchers at MSU, the U.S. Geological Survey and Carleton University in Ottawa. By Eric Freedman. FOR MARQUETTE, SAULT STE. MARIE, ST. IGNACE, BAY MILLS, TRAVERSE CITY, LEELANAU, PETOSKEY, HARBOR SPRINGS, LUDINGTON, MANISTEE, CADILLAC, GREENVILLE, BAY MILLS, ALCONA, OCEANA, GLADWIN, CRAWFORD COUNTY, MONTMORENCY, CHEBOYGAN & ALL POINTS. LANSING — There’s another move underway in the Legislature to expand Michigan’s 40-year-old beverage deposit law to include water and juice containers. But prospects for passage this year appear unlikely.